- I am looking for free advice on how to be more effective teaching people how to spin tops. - The forum has a lot of great information for those of us already up and spinning but there is not a lot of conversation about bringing new top spinners to the hobby. Tops have a pretty steep learning curve and it's a different experience than a yo-yo. 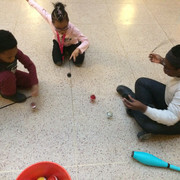 Anyone can pick up a yo-yo for the first time and make it go up and down. Not so with the spin top - it takes some technique and effort to make it go - and having someone show you how it's done is the best way to learn. - I belong to the Rochester Juggling Club and we have been invited to several events over the last few years. It seems like our opportunities to teach juggling are becoming more frequent so we have the opportunity to reach lots of people throughout the year. Mailman and I have been introducing top spinning at the events and it has been well received. I was hoping that some of you might have tips or advice for me on how to make top spinning accessible to people who may have never seen a spin top before. I have had some success but I am hoping to benefit for your experiences regarding what worked for you in the past - maybe sharing what didn't work would be just as helpful. I am gearing up for a top spinning breakout / workshop for this year's RIT Juggle In. Assuming I have attendees, I'd like them to get as much out of it as possible. 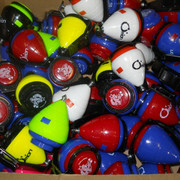 I am planning to give each attendee that learns to do a spinner and a skyrocket a top to take home. - here's a pic from last weekend where I shared some Spintastics tops with launchers at one of our library events. These three and another girl spent at least an hour with us. At one point I had 10 people spinning tops at the same time...some with strings and some with launchers. It was wonderful! My advice to teaching tops is this. Get a bunch of the same top. I recommend short circuit or cometa Dragon. Ensure all the strings work for your top. Length of the string is important to get a simple spinner. Tie a loop at the end so the crown wrap doesn’t cause issues. This one thing speeds up teaching period. Teach the spinner on the ground then have them try for the snow saucer. Battling tops is the best way to get kids (or anyone) to want to play them. All you need is to be able to throw and you are in the game. When you play with them and they see you do a sky rocket to retrieve your top, they will ask you naturally how to do that. Now the teaching starts. This is my method and it seems to work. Excellent advice from Jose there. Interest inspires success. Teaching throw to the ground; the main thing I have to repeatedly tell most folks is to pivot at the shoulder and not the elbow or wrist, and to push the top and stop - don't whip it with your wrist or let go early and pull it through. Most folks I have met can pick up on this within one session. Big Scoop next, then Skyrocket. I have come across a few who really hit a wall at boomerang. It is always something to do with the release but some folks are really good at hiding what they are doing wrong. Those folks just need time alone to go through the process... or a high speed camera and a clairvoyant boomerang coach. Thank you, gentlemen! Jose's loop idea is very good - it will speed things up quite a bit. And I always forget about the Big Scoop because I am old and fat and don't do it myself. Thank you for the quick responses and the great ideas! I still use a loop most of the time with my tops. It's really convenient and there are some cool tricks you can do from the trapeze with the loop. EDIT: Also for me what finally made me figure out the boomerang (my first major hurdle) was watching a short video someone shot of me trying it. Great and very progressive way of getting people in! Thank you for the advice and good ideas. My goal for the RIT festival is 12 new top spinners. I will have multiples of the same tops on hand to use for teaching. I'll post after the event to share how it went. 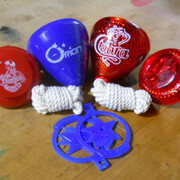 A lot of Mexican Trompos arrived at my house this week. 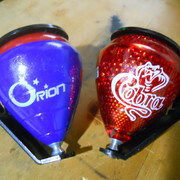 About 50% Orion and 50% cobra. Forum member Jrodriguez gave me a Cobra a while back and I thought it was a nice top - my son took it almost immediately and I haven't seen it since. Jose's comment about a loop in the string was seconded by Christop - I have noticed that the 'wrap around the crown and catch the knot on the shoulder part' of winding can be difficult to grasp. The Cometa tops I purchased have the plastic ring to place on the crown. This will make it easier to get folks spinning and negates the challenges that are caused by the crown wrap. I will for sure bring my snow saucer to provide a target for new throwers. Neff's advice about the mechanics of the throw is well received. The shoulder motion is important and I'll try to exaggerate that when I demonstrate. In addition to the RIT Juggle In, there are several offers for library appearances with the Rochester Juggling Club this summer. I'm hoping to be able to give away all of the tops during the course of the year. 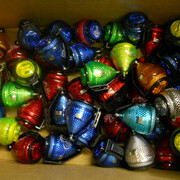 I'm really looking forward to RIT Juggle-In this year, and to helping with the spin top workshop. 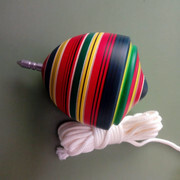 I hope we can introduce (or reintroduce) lots of people to the joy that is top spinning! Wow!!! That is a nice looking mountain of tops. Good luck with your preparations and your workshops. I am sure they will go well!!! The best top for teaching for me is the DUNCAN RIPCORD. It does some of the basic tricks - fantastic fighter - comes with hand spinner. I do have a couple of these - I'll bring them along, too. At the last library appearance I used the Spintastics tops with hand spinner. The Ripcord is a bit larger and is probably a better choice. Thanks, Cecil! Rings - It depends. Duncan rings are so stiff they pop off. Premier Rings are so soft it is hard to wind tightly. Cometa rings are just right. Shoulder action - Yes. Many folks have a habit of an upswing at the end of the throw, causing the top to land on its side. I stand in front of them and place my arm just over where their arm should go. It is a physical barrier to the upswing. It really helps. Same Tops - Yes. Sort of. Have a few Cometa Mini Azteca. This is IMO the best mini top and is easy to hold for the 3 to 5 year old kids. String Length - Contrary to popular opinion, many small kids need a shorter string. This is because they don't throw hard enough. Knowing how to tie a slip knot above the button to shorten the string by 6 to 8 inches will allow them to get the top to turn over. Sometimes you and make it longer as they learn. Winding - Direction many will wind the wrong direction. Explain how to test before throwing. "Does the top roll off you hand? No? that is for left handed throwing. Wind it the other way." Winding - Place your hand between the eyes and the top of slow winders. They will realize they can wind fast without looking. Skyrocket practice - "Time for skyrocket class. Line up. Watch me. Place your top upside down on the ground in front of you. Pretend you just threw it. The sting is still in you hand with the button. Grab the other end of the string with your other hand. Touch your toes with the string. With your throwing hand go around the top. With your left hand drop the string on the other side. Pull GENTLY."